Moroccan Lamb and Vegetable Stew with Cauliflower Couscous is a flavorful, comforting, healthy, complete meal, full of herbs and spices. Loaded with protein, fiber and potassium. 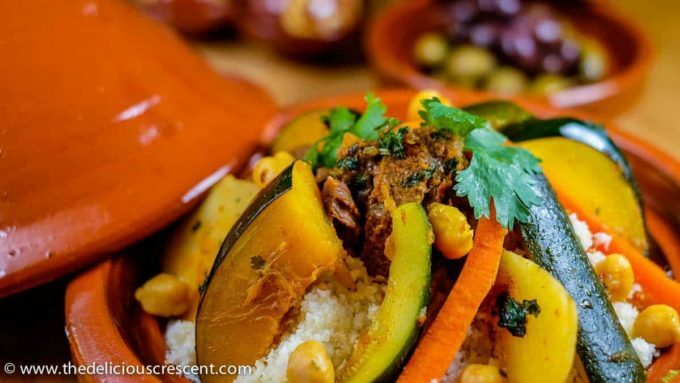 I have devoured this delectable Moroccan lamb stew during many a visits to Moroccan homes and a journey to fascinating Morocco. And over the years I have prepared it several times, only to fall more in love with it. 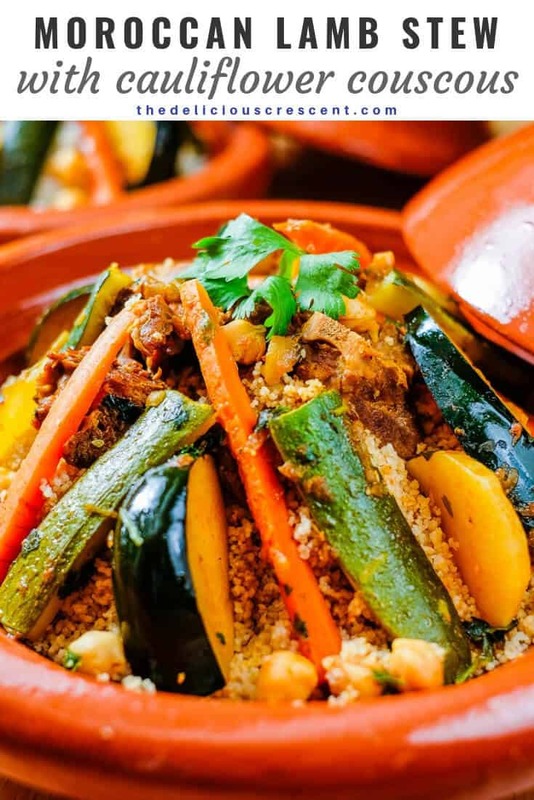 Just a look at the variety of vegetables, spices and herbs used in this – Moroccan Lamb and Vegetable Stew with Cauliflower Couscous – and you can already start feeling the flavors and get hungry. Don’t let the long list of ingredients deter you from making this. Once you gather all the ingredients and quickly chop up the veggies, the rest of it does not take much time. 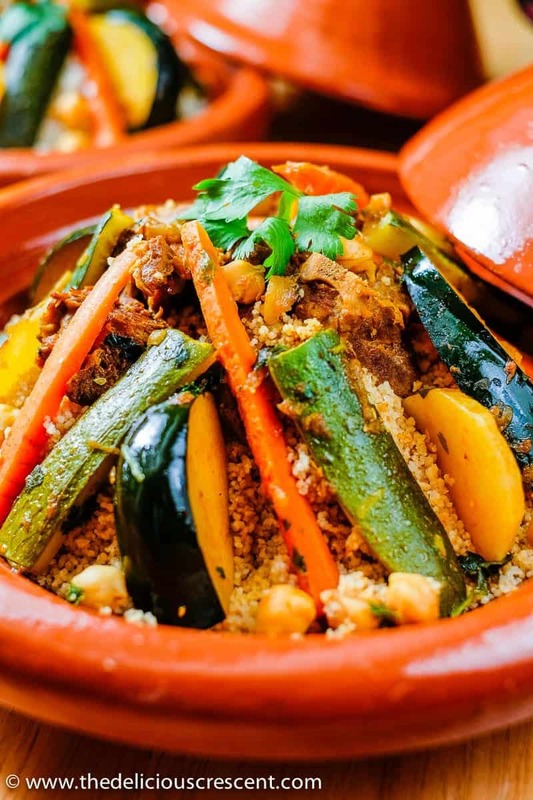 With this “Moroccan Lamb and Vegetable Stew with Cauliflower Couscous”, you will not need to make a bunch of side dishes to complete the meal. And you could even double the stew recipe and freeze it for later. Lamb is an excellent source of the vitamin B-12. It provides high quality protein with all the essential amino acids for growth and maintenance. It is also a very good source of niacin and selenium. And is a good source of zinc, phosphorus and Iron. However, lamb is a red meat and therefore should be eaten in moderation. Because, a diet rich in red meat can increase the risk of cancers, heart disease etc. Grass fed lamb is the most desirable option as it is a better source of omega – 3 fatty acids and conjugated linoleic acid, which is associated with favorable health benefits. Apart from the lamb, this stew also has an excellent plant protein source – the chickpeas. And so you will not need a whole lot of meat and in fact I prefer to use lean lamb with “bone”, to add to the taste and flavor. While I start out with lean lamb, I add a little bit of ghee right at the end of cooking, when its rich and nutty flavor can still linger and hit the palate right away. Besides, when it comes to grass fed ghee, a little goes a long way. Here, I mix regular couscous with “cauliflower” couscous. Especially when you combine the two, you can easily pass the test with the pickiest of eaters. And why would you want to add the cauliflower? To lighten up the calories and carbs, to make it more filling and to add some extra veggies. These tips come in handy when you are trying to cook a meal for someone who is a diabetic or is trying to lose weight and needs to manage the carb intake, and to sneak in some veggies for your kids or to serve a balanced meal to your family. All the while keeping it tastefully healthy! In the recipe and notes section below, I detail the different ways to make “cauliflower” couscous. You could even make it gluten free if you skip the regular semolina based couscous. By the way, cauliflower tastes great in a creamed version too. Trust me, this Moroccan Lamb and Vegetable Stew with Cauliflower Couscous recipe will become a keeper in your growing repertoire. Enjoy! Moroccan Lamb and Vegetable Stew with Cauliflower Couscous is a flavorful, comforting, complete meal, full of herbs and spices. Loaded with protein, fiber and potassium. Drain the water from the soaked chickpeas and cook it until soft. Meanwhile, heat the olive oil in a 4 to 5 quart cooking pot at medium high setting. Add the chopped onions and sauté until golden brown. Add the lamb and brown it for a few minutes. Next add the ingredients from grated ginger through black pepper and stir. Then add the chopped tomatoes, stir and cook about five minutes. Stir in the tomato paste. Add water, bring to a boil and allow it to simmer for about an hour. Next add the cooked chickpeas and cook for about 10 minutes. And then add the vegetables (I use organic and retain the peel), herbs and salt to taste. Add raisins (soaked in water) if you prefer. Let it simmer for about 20 minutes until all the ingredients are well cooked*. Add one to two teaspoons ghee in the end, right before serving. Prepare the Cauliflower couscous about 20 minutes before the Moroccan Lamb and Vegetable Stew is done*. Cut the cauliflower into small pieces and pulse it in a food processor until it turns into couscous sized granules. Spread it out on a foil or parchment paper lined baking sheet and bake for about 10 to 15 minutes*. Meanwhile, in a medium saucepan, bring about 1 3/4 cups water to a boil with 2 pinches of salt (or as per taste). Add olive oil or butter and stir in the couscous. Remove the saucepan from the heat source and allow it to stand for about 5 minutes or more until the water is absorbed. Using a fork fluff the couscous to break any lumps. Combine the cooked grated cauliflower with the couscous, using a fork to fluff it up. Serve this Moroccan Lamb and Vegetable Stew with Cauliflower Couscous immediately. 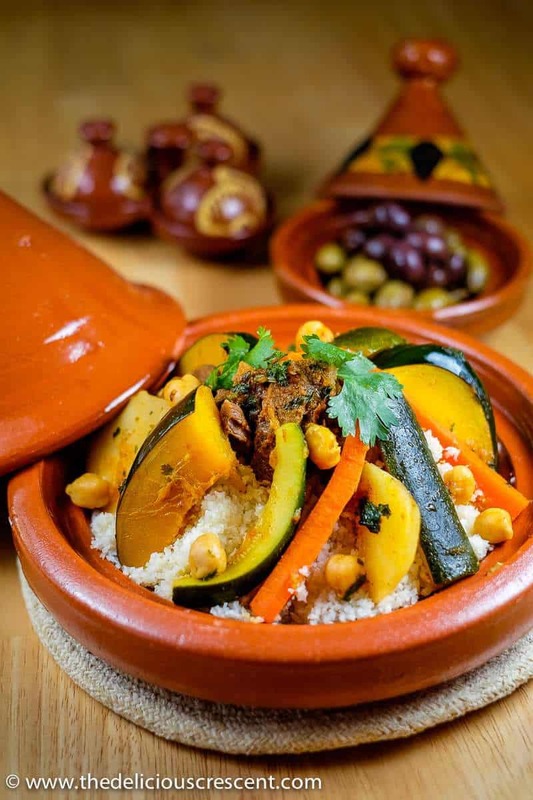 I arrange the vegetables and lamb over the couscous and serve the remaining gravy on the side. Offer some marinated olives and harissa or a ground red chili paste (like sambal oelek) on the side. Ras el Hanout is a specialty Moroccan spice blend available at Moroccan or Middle Eastern stores and online. For this Moroccan Lamb and Vegetable Stew with Cauliflower Couscous, you may also use butternut squash or sweet potato instead of acorn squash, or even some in addition to it. Generally the cooking time for lamb may vary from 1 1/2 to 2 hours. Adjust the timing of the addition of chickpeas and vegetables accordingly, to add those about 20 minutes prior to when the lamb should be well done. You may follow the package instructions for cooking any commercially available couscous. Alternatively the grated cauliflower may be sautéed with 1 to 2 teaspoons of oil for about 5 to 7 minutes. * Nutrition facts not including salt. Check for any added salt in spice mixes and other ingredients and adjust. This is so colorful and appetizing! 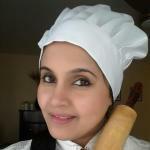 I love to learn cuisines from the world!Thanks for sharing. This dish looks so yum. I love exotic food.. thanks for the recipe. We visited Morocco last summer and fell head over heels in love with the country, colours, people and food. 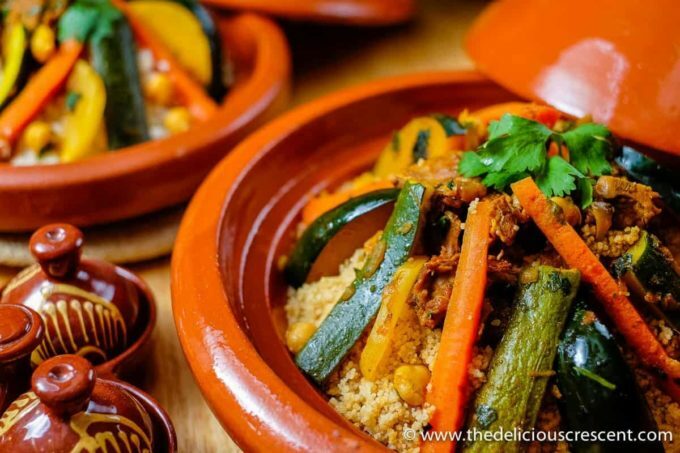 I cook tagines quite often with loaded with Moroccan spice blends and veggies and seriously, can’t get enough of it. Love how you have used ghee in the recipe to enhance the flavour of already fantastic recipe. Thanks Sia. I can relate to your feelings :). Yes, the hint of ghee works great in this.